Remember the old song by the great Stevie Wonder Signed, Sealed, Delivered I´m Yours? On my post Divi Children or Engined users: Wait before updating to Divi 2.4 I said yesterday that I would release an updated version of Divi Children, hopefully in just some hours. Well here it is, less than 24 hours after the official Divi 2.4 release: Divi Children 2.0.8 is ready for download at the Divi Children plugin page. As I mentioned yesterday, this Divi Children update will not only make newly created child themes work with Divi 2.4, but it will also let you update your previously created child themes to make them compatible with the new version of Divi. What is new in Divi Children 2.0.8? If you´re looking for new Divi Children customizing features, you´re going to be disappointed. This is just a compatibility update, forced by the facts I explained on my previous post. If you follow this blog you know that there are a lot of features waiting to be included in Divi Children. The exact number of features waiting to be included will now be the following: most of the features included in the Engined child theme less the ones that no longer make sense because they have already been included by ET in the Divi 2.4 update. But, as I said yesterday, Engined is a complex child theme and it´s going to take me longer, so my priority was to provide a new Divi Children update for all those sites that are using child themes created by Divi Children. That means that everything that´s new in Divi Children 2.0.8 is under-the-hood work. The way Customizer CSS from the child theme is sent to output has been changed, so now it takes precedence over the output from Divi 2.4 settings. This was needed because otherwise the new Divi code would override child theme settings and most of the customization done via the Customizer child theme sections would not work. You should be aware of this change because some settings are now redundant, so in some cases you might think something is going wrong. Let me give you an example: If you´ve customized your Footer Bottom text size to 15px (in the Divi Child – Footer Bottom section of the Customizer), you won´t be able to change it to 14px using the Font Size setting of the Divi 4.2 Bottom Bar Customizer section (inside the Footer panel). All the Customizer settings sections that deal with general parts of your site, like Main Footer, Footer Bottom, Footer Credits, Main Sidebar or Post Meta Data, have been updated to work with Divi 2.4. Here you also need to be aware about the fact that some settings are going to be redundant with Divi 2.4 settings, so the same warning I made above applies. Divi modules that have been customized using the Divi Children Custom Code custom selectors will also work with Divi 2.4. In general, the child theme settings will take precedence, providing you didn´t modify the new Divi 2.4 Advanced Settings of the customized module in the Divi Builder and left those settings with the default values. Divi Children Magic Codes were intended to modify not the styling but the functionality of Divi modules. However, the existing Magic Codes are not longer needed because the functionality provided by the ones for the Blog modules can now be handled by the Offset setting in the Divi Blog module, and the much needed option for the CTAs links to open in a new browser tab (that was provided via the cta_outbound_link Magic Code) has finally been added by ET to the CTA module in Divi 2.4. Nevertheless, I wanted to make sure that any existing site running on a child theme created with an earlier version of Divi Children worked alright for you without the need to modify settings. So I´ve included extensions for the new OOP module classes to make sure your Magic Codes will still work in case you´ve used any of them in your site. Ok, this is the only thing I haven´t updated. You´ll notice I´ve kept the Divi Children Custom Code for custom sections and I´ve also left the corresponding output code, but this is a feature that is bound for extinction. Why? Because the functionalities provided by the new Divi 2.4 structure for sections and rows are far superior to anything you might accomplish with this Divi Children feature. Also, I´d originally included it because Divi was missing something that was quite important in my opinion: rows couldn´t be customized in the previous versions of Divi, they didn´t even have settings for it! But now with Divi 2.4 you´ll find interesting settings to customize your rows. And not only backgrounds or paddings as I was trying to provide via Divi Children settings, but also some other things like the new gutter settings. So, in case you´ve used any Section with Custom Rows Divi Children settings in your site, you´ll need to go and check whether they´re working as you expected or not, and you might need to edit some Divi section and/or row settings to make sure everything is looking fine. Sorry about it, but it just didn´t make any sense trying to keep any compatibility in this area. New child themes created by Divi Children 2.0.8 will no longer load the Divi parent stylesheet via the @import rule in the child stylesheet (a method that is no longer considered best practice) but enqueued via a new hooked function in the child theme functions.php file. So this is something new but, like I said, also under-the-hood work. At any rate, please backup your site before you update. 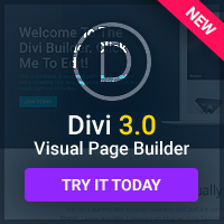 I´ve tried to check everything out but I didn´t have much time to do it because I wanted you to be able to update to Divi 2.4 as soon as possible. Be also aware about the fact that even some CSS child theme modifications added by yourself could create problems or not work at all when you update Divi, it´s happening to some people. The new 2.0.8 version is already available for download. Just follow the instructions for updating it if you have a previous version of the plugin installed in your site. The Divi Children 2.0.8 plugin admin files have also been updated to allow automatic updating of existing child themes created by previous versions of Divi Children. Update Divi Children to 2.0.8. Thanks for being so fast. I wanted to try the new Divi. Nothing to update or install. You are all set! Do I download the zip and ftp the files, overwriting the old ones ? It looks like you haven´t updated Divi Children correctly before trying to update your child theme. Please follow the instructions for updating Divi Children and, once you have the new 2.0.8 version installed in your site, update your existing child theme with it. Thanks. Silly of me. I confused between “Updating Divi Children” and “Updating child themes”. I have a divi question if you have a minute. What is the best way in Divi2.4 to have a banner full width between the top-header and the main-header (with the navigation main-menu)? I hoped in divi2.4 there will be a straightforward way to do it, but I didn’t find. In previous version, I used css, my banner as background of main-header and adjusting the position of top-navigation div with negative top-margin. I just don´t have the time right now to check a way to do that in Divi 2.4 because I still have a lot of things to do trying to adapt Engined to Divi 2.4, but I´ll take a look at it as soon as I can. Sorry if it takes longer than you need. I’m new to all of this, and have just installed Divi Children. But I don;t know what the difference is between Child Themes and Divi Children? I thought, from my research, that I can use Divi Children as an automatic way of doing Child Themes. Is this correct? And if so, please can you direct me to a tutorial for Divi Children dummies! Seriously, I am a Graphic designer, but very new to creating my own site through WordPress. Also, slightly off the subject, can you please tell me how to change the link for VISIT SITE so it connects with my homepage? You´re right, Helen. You can think of Divi Children as an automatic way of creating Child Themes. It´s very easy to use, as you can read on its first release post. Once you´ve created and activated your child theme, you can change your site credits via the WordPress Customizer. Thanks so much for your reply. The link was very helpful especially to add screenshot & change footer credits. What I still don’t understand, is how and when to use this new Child Theme. When I am working on a Page, and creating my sections and modules etc, do I create as per usual, or do I have to always click something that connects it to the Child Theme. I am guessing that any customisation in the Child Theme will be automatically integrated into Divi Builder as I create designs… but I just wanted to be sure I am on the right track? Thanks Luis for the support and how to update the children plugin, I think all works fine now and can’t wait to try out the new Divi options. So impressed Luis! And big, big thanks. I am so glad I’m using your child theme! I only tried divi once on a testsite and used your child theme. Now the new divi release is here, I wonder do we still need a child theme? I read on their blog several times in the comments that Nick said you don’t really need a childtheme anymore. So I wonder and am confused as I want to build another website with divi next week what do I need to do. Do I need a childtheme and if I do do I need divi children of do I need engined? I greatly appreciate your advice. You don´t need a child theme if you don´t plan to customize your site beyond what Divi offers out of the box. But I really encourage you to use a child theme if you do, whether you use Div children to create it or not. At the time being, please don´t use Engined with Divi 2.4 yet, for the reasons I explained on this post. Thank you for all the work you do. I have updated only 1 of our sites today to “test run” all the new changes between your child theme and the new Divi before updating the other sites. Under APPEARANCE on the sites NOT updated, there is a “Divi Theme Options” section which allows us to make changes to Divi parent like with header integration, etc. I don’t see that section with your update. Am I missing something? Silly me…disregard that last comment to you. I see that Divi put their settings info in its own section on the dashboard instead of under Appearance. That has changed in Divi 2.4, not because of Divi Children: Theme Options is not longer under Appearance, Divi has now its own Dashboard menu element (at the same level than Appearance). Look for it at the bottom of your admin menu, you may find it below Settings. Hi Luis, I know this is probably too soon, but any ETA on Engined please? I’m currently in the middle of designing 3 sites with it, and very keen to get upgraded to 2.4 as soon as I can. Many thanks for all your work, it is very much appreciated. Hi David, please read my reply to Sheila here. She just asked the same thing. Have you seen that before? Should I just add a styles.css file to the zip and try again? Not sure what’s going on. I’ve rebuilt my Engined site in 2.4.2 and would like to use DiviChildren for footer editing. Thanks. You´re trying to install Divi Children (a plugin) as a theme. Please follow the instructions and install as a plugin. DUH! Sorry about that. Hadn’t really used it before and thought it was a blank child theme. Now I know. THANK YOU! It’s STILL not taking the orange! I can’t figure out why! After changing to Divi Children the 3 blurbs on the home page stopped showing up. I figured out that I had to recreate the custom widget areas and reassign them! Didn’t realize they’d be lost when adding a child theme! WHEW! “The way Customizer CSS from the child theme is sent to output has been changed, so now it takes precedence over the output from Divi 2.4 settings. This was needed because otherwise the new Divi code would override child theme settings and most of the customization done via the Customizer child theme sections would not work. I guess you´re trying to change it in the native Divi setting. Regarding the blurbs, I don´t know what the problem can be, Divi Children created child themes don´t include any code to modify blurbs, and my test site working on Divi 2.4.2 shows them correctly when I use a child theme created by Divi Children 2.0.8. Oh, I guess by “blurbs” you meant your footer widgets. Sorry, I thought you where talking about blurb Divi modules. Right, it´s the same thing that happens with menus, every time you use a new theme you need to reassign your widgets, even if it is a child theme. Feeling totally stupid now! I finally figured out I had to change that footer bg color in the Divi Children section. So I’m good there. And no, I was not talking about the footer. I had added 3 custom widget areas for blurbs on the homepage. But I’ve also solved that now by recreating them. They were lost in setting up the new child theme, much as one must reset the menu. I just didn’t know it. Sorry to interrupt your progress on Engined! I´ve just double checked Change Screenshot in Divi Children 2.0.8 and it works perfect for me. I don´t know what can be your case, but what you mentioned sounds pretty strange. Everything seems fine except for some CSS changes I did using the older child theme (style.css). When I switch back to the old Child theme everything is back the way I had it. Do I need to copy/ftp the style.css file from the old Child theme to the new 2.0.8? Or did I miss a step in the update instructions. I’m using a staging server to test the update – so fortunately I’m good there. You don´t need to copy anything from your stylesheet if you update your existing child theme via the “Install or Update Divi Children Engine” tab on the main plugin page. Since you say “when I switch back to the old child theme”, I´m assuming you´ve created a new child theme with Divi Children, instead of updating your previously existing child theme with it. Okay – so no need to create a new Child theme. Just update the existing one… simple. Got it. hello it worked out at the end sorry thanks for your reply! I am beginning a remake of an old site using the latest Divi release and am also using Divi Children 2.0.8 to create the child theme… I’m wondering if the “Patch to fix Divi issue: Duplicated Predefined Layouts” that Divi Children puts in the functions.php file is still needed…? I was the person who first brought this issue to your attention, so I remember that it has been quite a while, and that it was brought to the attention of ET via the Divi support forum back then… I believe your patch for this was shared in the forums at that time as well …? That patch has been included in Divi Children since its 1.0.1 version, more than a year ago by now. But, believe or not, ET has never fixed the function that was causing the issue (the one my patch fixes), not even in Divi 2.4. I sent you a message via your form a few days ago, but perhaps it got lost. I can allow my footer links to have custom target=”framename” attributes? Sorry, I think I never got that message. There isn´t any Divi Children option to allow you to do that. Thanks for the response. I know that targeting a custom frame is not a built-in option for Divi Children…was wondering if you had any tips or thoughts (or a link for further info) on how to add it in via footer.php (or functions.php?). Thanks anyhow, and thank you for developing and delivering such a nice asset to Divi! Thanks again for sharing your work and time on Divi Children, Luis! I´m glad you sorted it out, and sorry I didn´t make it on time. For your info, in case you need to do anything else regarding your footer credits: Divi Children has an option for updating the footer.php file so it´s always up to date with the parent Divi footer.php. So it´s not a good idea to modify footer.php. Actually, my Engined child theme doesn´t even use a custom footer.php file (neither will do future versions of Divi Children), I figured out a different approach to customize the footer credits without interfering with the footer.php file. What you can modify in order to change anything about those links is the Divichild_footer_credits_generator() function you´ll find in the divi_children_functions.php file inside the divi-children-engine/includes/ folder of your child theme created by Divi Children. But you´d need to keep track of any change and re do it in case of updating the Divi Children Engine later on. Thanks for that added bit of info, Luis. For the time being I’ll roll with the ‘simple’ solution, as the footer itself is super-basic (just ©, website link and a link to my site as the developer) and any updates will get retained through Divi Booster. I am using your child theme for Divi 2.4. at least this theme is activated. When I use whatwptheme it does not say that I am using a child theme. Can you please help me out on this matter? I know. 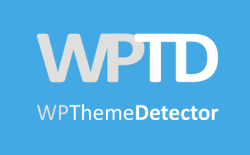 I noticed that even WPThemeDetector (one of my sites) does not detect the child theme, whereas it used to. I believe it is because child themes created with Divi Children 2.0.8 now enqueue the child styles instead of using the old @import rule. But I didn´t have the time to develop new code to make my theme detector to detect child themes like that yet, I´m too busy at the moment with the Engine update. first of all thanx for your brilliant work! I have an issue with your child theme (2.0.8): I’m using Divi 2.4.4, and with your Child theme portfolio just doesn’t work. It shows the images grid, but when I clic on a project, a 404 page shows. I don´t see what can be wrong, child themes created with Divi Children don´t mess with the portfolio at all. Can you provide a link to your site? ps. your work is really appreciated! The divi children settings for the sidebar only takes effect on my buddypress pages. I set the sidebar to 30% (1/3) of the page but my normal pages and posts are still 25%(1/4). Don´t forget Divi Children is a plugin. You´re trying to install it as a theme. Is it just me?? I am having so many issues with the Divi updates. I am currently using Divi 2.4.6.2 because I am petrified to update AGAIN!! I see they have yet ANOTHER update – 2.5.2. The first major update to 2.0 literally broke all 4 of my sites…weeks of fixing them…only to have more and more Divi updates that create more and more issues. I know you have nothing to do with the theme development. And I love your child theme plugin. It has been a godsend. I am just wondering if anyone else is experiencing “Warnings” and “Fatal Error” messages with any update past 2.4.6.2. The LOAD LIBRARY is not working, and can’t even ADD IMAGE in any of the modules. On one of my sites I can’t even create a new page…get “Fatal Error” messages about max “size”…which my server host is attempting to help with. I have left support posts on Elegant Themes…and they are good about giving help…just not in a timely manner. And if they tell me to deactivate all my plugins one more time I will scream! I manage 4 sites…all of them event sites and actively taking reservations. I can not deactivate plugins that didn’t have an issue BEFORE an update. For anyone reading this, I apologize for the ranting. The posters on this blog are always so supportive and helpful…just needed to know I’m not alone in these issues…and to possibly have some angel out there who may know a solutions to the current update whoas. Is your plugin compatible with Divi 2.5? Yes, the current version is compatible, as far as I know. I think I´ve tested everything with Divi 2.5.3, but please let me know if you find any issue. Thank you very much for this plugin! WordPress noob plus tech idiot here so do pardon me if my questions sound silly! 1. I have the Divi Theme installed but I no longer have access to updates for the theme. So if I install Divi Children and work on a website using the child theme and Divi Children has updates in order to be compatible with the latest version of Divi (which I will not have), will these updates affect my website since I’m running on an outdated version of Divi Theme? 2. If WordPress gets updated, will that affect me since I’m using an outdated version of Divi Theme? 3. With a child theme, am I right to say that it will not be affected by any updates from either WordPress or Divi theme itself? Oh, and one more question please, will this plugin help me create a new widget areas? Thank you for your help! Divi 2.6 has just been released and I just tried upgrading a site that uses a Divi child theme created with Divi Children 2.0.8. The Divi Options panel on the child theme breaks with the Divi 2.6 update. Apparently they have redesigned the Divi Options section completely. Will there be an update for Divi Children to make it compatible with Divi 2.6? Fixed bug where ePanel CSS would not load when a child theme was enabled. I don´t understand what went wrong with the final release, though, because I was part of the Divi 2.6 Beta Testers group and the beta versions I tested didn´t show that problem at all. Thanks for the prompt reply and the explanation. Also, thanks for your excellent work on the plugin! You´re welcome. Glad you like it! I’m having trouble using your plugin, for some reason the CSS I save seems to be taking an overnight process to update my site. Can you assist? Can you send me details about your problem via email? You can use our contact page. First things first: THANX for making this wonderful plugin available for FREE! It’s an amazing DIVI plugin. Would it be possible and could you consider to add an extra option to the “Divi Child – Main Sidebar”+”Divi Child – Footer Bottom” to HIDE/SHOW the FOOTER ?